What is Pediatric Trigger Finger? Pediatric trigger finger, also known as congenital trigger finger, is a condition affecting the flexor tendon of the finger or thumb. Symptoms occur when there is a size mismatch between the tendon and the sheath that surrounds the tendon. This causes a locking or catching of the finger with attempted bending of the finger with associated pain, which is referred to as “triggering”. In pediatric trigger finger there is often a nodule (a benign thickening of the tendon) that catches on the overlying sheath causing the finger or thumb to trigger. In severe cases the finger or thumb can become locked in a bent position and is unable to be straightened. What Causes Pediatric Trigger Finger? Pediatric trigger finger is often caused by a nodule on the tendon referred to as Notta’s node. As seen in the picture above, a nodule on the tendon makes it difficult for the tendon to glide through the sheath or pulley. This can cause the clicking sensation as the nodule pops through the pulley with bending and straightening the finger. Sometimes there is not a nodule and the sheath has simply become tight around the tendon preventing it from gliding. In other cases, although less common, the tendon can be abnormally formed, which prevents smooth gliding of the tendon. Rarely, pediatric trigger finger can be associated with other medical conditions such as mucopolysaccharidosis and central nervous system disorders. Trigger finger is diagnosed based on history and clinical exam with the finding of triggering of the digit and with a palpable nodule at the base of the finger. Occasionally an ultrasound or MRI is indicated to further evaluate the structure of the tendon. Treatment options include both nonsurgical and surgical treatments. Often a period of nonsurgical treatment is tried which can include massage and stretching and/or splinting to keep the finger straight. Trigger thumb is more likely to be successfully treated with nonsurgical techniques than trigger finger. If nonsurgical treatments fail or if the finger is locked in a bent position and is unable to be straightened, then surgery may be required to release the sheath from around the tendon so that the tendon may glide freely. If surgery is required to treat pediatric trigger finger, it involves general anesthesia to keep the child comfortable during surgery. A small incision is made in the palm to release the sheath (called the A1 pulley) at the base of the finger. Sometimes a longer incision onto the finger is required to treat other pathology such as an abnormal tendon. Once the surgeon is sure the triggering is resolved the skin is closed with suture. A soft bandage is applied to protect the incision. The patient goes home the same day once recovered from anesthesia. Once the incision has healed the child may return to normal activity. 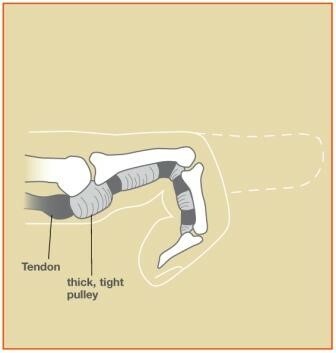 If your child has signs or symptoms of pediatric trigger finger feel free to call our office to schedule an appointment with one of our fellowship trained Orthopaedic hand and upper extremity surgeons that specialize in both the non-surgical and surgical treatments of the hand, wrist, elbow, and shoulder.